Long night? Most of us have been there and woken up with the dreaded hangover… There are a few who are fortunate enough never to experience this in their lives but for the poor, unfortunate souls who drank their weight in shots/bottles/goblets/barrels, etc. the previous night, there is hope. 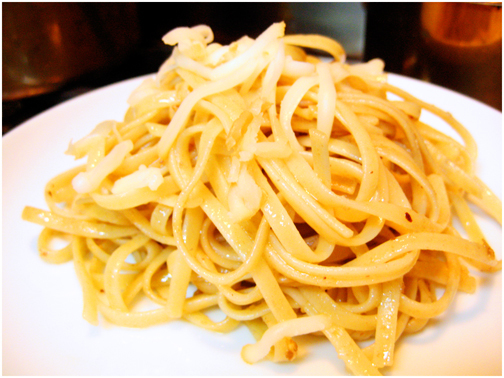 A steaming bowl of pasta dressed in olive oil with browned bits of garlic and a light kick of heat combining the creamy saltiness from the melted anchovies. It’s so simple but it has gratification in every bite. There’s nothing like curling up in bed or on a couch with this dish and zoning out in front of the television in your pajamas. The great thing about this pasta dish is that the sauce can be prepared ahead of time and it keeps well in the fridge. If you’re one of those people who have good foresight, it’s a smart move to make the sauce and toss it altogether with some pasta so that when you come home, there’s already a snack waiting for you. Bring a pot of water to boil. Cook pasta a minute less than the package instructions. In a pan over medium heat, heat up the olive oil and add the chili and garlic. Cook for a minute or until the garlic is fragrant. Do NOT let the garlic turn brown. Add the anchovy fillets and let it melt. Be careful at this point the anchovy fillets will make the oil pop a little bit. Lower the flame and cook until the anchovy is dissolved. Toss in the freshly cooked pasta onto the pan until well coated. Serve immediately. Freshly grated Parmesan cheese is optional. kitchyart!! this sounds too yummy. I think I will try tonight. perfect for cold ny weather!